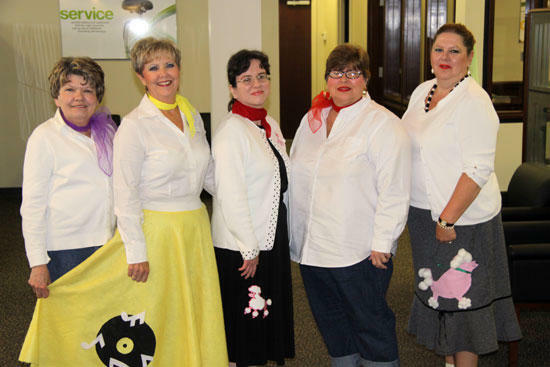 From left dressed in their 1950s-era Halloween costumes Friday are Region Bank employees Virginia Campbell, Cheryl Johnson, Charlene Bogle, Wanda Gunter and Beck Harris. Regions Bank on the Woodbury Town Square chose the 1950s as its them for the Halloween Holiday this year. Employees dressed up in costume clothing from the era, and 50s music played all day over the speaker system inside the bank. Although the official date for Halloween is on Sunday (Oct. 31), the City of Woodbury is officially holding trick-or-treating on Saturday night. I think all of the ladies look great!! Doo-Wop, doo-wop!! I like the picture and you look so good.